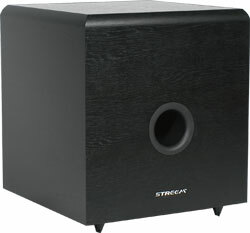 Dimensions (H W D): 18" x 15" x 15"
The SW-10 low frequency powered subwoofer is capable of reproducing sound as low as 30 Hz. Positioned properly within a home theater setup, preferably in the corner of a room, a "sub" will emanate throughout the room evenly so you will feel the action surround you. Although a subwoofer is not always necessary in every home theater setup we firmly believe that it is always a welcome addition and can only enhance your experience.